Assault on Precinct 13 (1976) | 'TAIN'T THE MEAT… IT'S THE HUMANITY! I’m embarrassed to admit this but for various bizarre reasons I avoided this film for years even though I’m a fan of John Carpenter‘s early films. Somehow I’d gotten it into my head that Assault on Precinct 13 was a stark prison movie and that premise never really appealed to me. I was also under the impression the movie was in black and white! I’ve no idea where any of those misconceptions came from but they unfortunately resulted in me ignoring the film for decades despite being a fan of The Fog, Escape from New York and the incomparable The Thing. So you can imagine my surprise (and delight) when, in the late ’90s, I stumbled across a late night showing of the film on BBC2 and discovered it wasn’t a grim prison drama but in fact a fast-paced, action-packed exploitation homage to both Howard Hawks’ Rio Bravo and George Romero’s Night of the Living Dead. The movie’s plot is fairly straight forward: a street gang seeking vengeance for the slaying of some of their gang in turn murder an innocent young girl. Her father then kills the gang leader in retaliation and seeks protection from the gang in a decommissioned police station. The gang surround the station vowing to kill him, the police officers, and the prisoners trapped inside forcing the occupants to fight for their lives. The movie’s violent second half contrasts strongly with it’s relatively sedate first half hour as Carpenter slowly introduces and expands on the film’s characters: the cop on his first day on the beat; the laconic prisoner being transferred to another prison; the gang members swearing a blood oath of revenge; the doomed father and daughter driving home. All of these disparate threads are brought together suddenly with a bang – literally. The murder of the girl by the gang leader is as shocking as it is unexpected and has lost none of it’s impact even in an age where violence in movies has become depressingly common place. Carpenter directs with a steady hand and keeps both the story and action flowing. The violence is brief but intense and the cast is solid, with Austin Stoker playing the cop, Darwin Joston as the enigmatic Napoleon Wilson, Tony Burton as his fellow prisoner and Laurie Zimmer as the unflappable secretary. Apart from borrowing the basic plot from Rio Bravo, Carpenter also infuses the film with several of Hawks’ trade-mark touches: Joston and Zimmer’s dialogue is clearly modelled on the dry, cool banter between Bogart and Bacall from The Big Sleep and To Have and Have Not; and Joston’s repeated request for a cigarette was a staple of several of Hawks’ films. And to extend the western motif further there’s even a nod to Jason Robards’ ‘something to do with death’ speech from Sergio Leone’s Once Upon a Time in the West. Made in less than three weeks and on a rock bottom budget ($100,000) the film was Carpenter’s second movie and the first he filmed in Panavison. He not only wrote and directed the film but also edited it under the pseudonym John T Chance, the name of John Wayne’s character in Rio Bravo. He also wrote the distinctive score which includes the memorable keyboard refrain that Carpenter admits was a slowed down fusion of Led Zeppelin’s Immigrant Song and Lalo Schifrin’s theme from Dirty Harry. Although the film didn’t fare very well in the US it did do well in the UK, being especially well received at the 21st London Film Festival in 1977. And in the 30 years since it’s release the film has undergone a reappraisal by critics and is now considered a classic of Seventies cinema, even inspiring a decent 2005 remake starring Ethan Hawke and Laurence Fishburne. 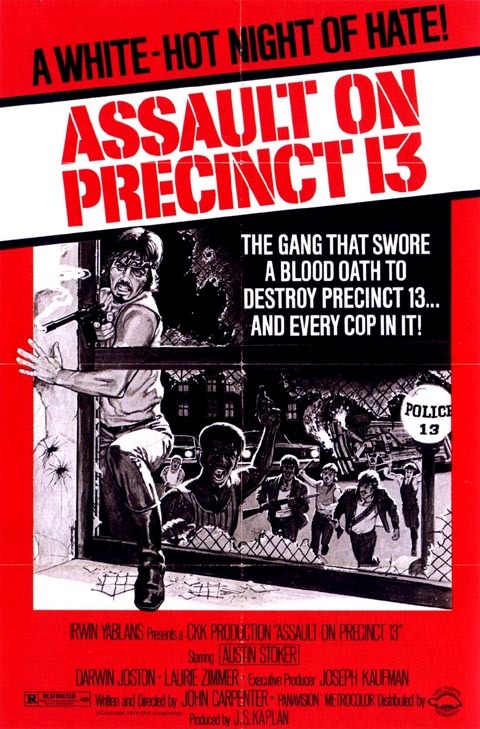 Lastly, a quick word on this Blu-ray release: for some reason the original 1976 version of Assault on Precinct 13 isn’t available to buy on Blu-ray in the UK. There is a region-free version available for import from the US but instead I went for the Danish version available from Amazon, mainly because I didn’t want to wait the two weeks for delivery or risk a import tax charge. The Danish version features the original English dialogue coverted to a 5.1 Dolby Digital soundtrack and the Danish subtitles can be turned off so don’t let it’s country of origin deter you from purchasing this version.